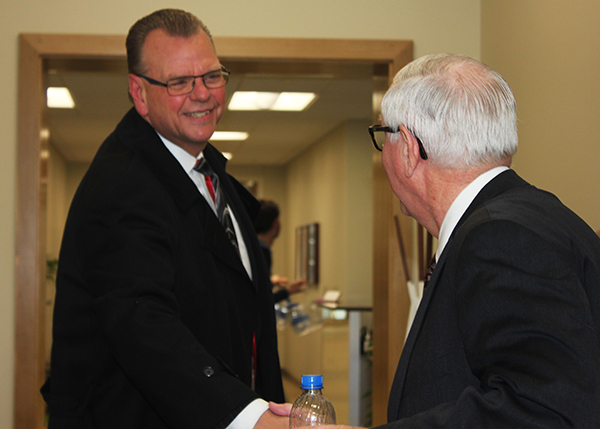 Treasurer Stenberg greets Kirk Kellner of Omaha, region bank president of Wells Fargo. Kirk Kellner had just arrived at the airport in Las Vegas for business when he got a call on his business cell phone from a number he didn’t recognize. He didn’t answer, and the call went to voicemail. When he listened to the message later, the caller said she was from the Nebraska Treasurer’s Office and had unclaimed property for his mother, Geraldine. Cautious – and convinced this was a scam – Kellner called the listed phone number for the Unclaimed Property Division of the Nebraska State Treasurer’s Office, not the number left on his cell phone. He discovered, to his surprise, that the call was legitimate, that the caller was unclaimed property specialist Kim Ackerman, and that she truly did have money – almost $1,000 – to be exact for his 87-year-old mother in Omaha. The money was in the form of shares of stock from a life insurance policy that was at least 70 years old. Kellner’s mother vaguely remembers putting away 10 cents a week (or a month) for an investment when she was still single, living at home with her father. The stock was listed in her maiden name, Geraldine Shindel, and the address on the property was her childhood home. “When I told her, at first she didn’t believe it,” Kellner said. “Oh, come on, you’re kidding me,” she told her son. Kellner, region bank president of Wells Fargo in Omaha, complimented Kim for her professionalism and her use of detective skills to track him down. “She was great on the phone,” he said. Still excited about the surprise, Kellner said his mother is even more excited. She is thinking about using some of the money to buy a new Easter outfit.